I just created a list of Oriental Adventures related products from the TSR Era. In addition there is the 3E OA/Rokugan material as well as some scattered material from 4E and 5E. How much of this would work with the Malatra subsetting? Are there classes, races, monsters or other things generally associated with Oriental Adventures type campaigns that would not work with Malatra? Re: [Malatra] How much of Oriental Adventures fits? How much of this would work with the Malatra subsetting? Very Little. Possibly some monsters if a reason could be made for how they arrived there (difficult) and why they haven't become a major problem. Are there classes, races, monsters or other things generally associated with Oriental Adventures type campaigns that would not work with Malatra? The Tam'hi and Katanga of the Malatra setting are renamed Spirit Folk and Hengeyokai respectively. Korobokuru exist there, as well as a few monsters from the oriental settings (kani, bakemono, oni, a few shan sao, and a single marrashi etc) but many of the themes between the two settings are not quite compatible. The Malatra subsetting was more low powered and low tech than the rest of its OA placement's neighbors, and so certain monsters might be WAY too powerful for them. The setting was very big into slowing down the cross contamination with the outside world. But as the setting aged, it became less of an fantasy style equivalent of pre-colonial indo-china (modern Cambodia, Laos, Thailand, etc) , and more an analogue for jungle themed adventures. Some adventures have a very "Lion King" flavor, others are Tarzan-esq. Capybara, jaguars, hyena, and giraffes are all been mentioned in various adventures and none of those animals would be indigenous to the oriental region. Overall, the setting directors took a "is there a good reason for it to be here?" approach to various real world animals, as well as D&D races and monsters. So in answer to your question: Yes...but.... there can always be exceptions. As for the other way (raiding the sub-setting for OA stuff), two player races: the shu (jungle halflings) and the Saru (intelligent apes) might be fun for certain OA games. And another race the butu (a crossbreeding between bakemono and kobalds) although not considered enemies in Malatra, could become real antagonists for small communities in Kara-tur. So you are saying that it is wrong to label Malatra as an OA setting? History of the Living Jungle wrote: The current human inhabitants of the Malatran Plateau are descended of two separate human races: the indigenous humans of southern Kara-Tur, and an ancient spelljamming race from a distant crystal sphere. I'm not sure if each modern Nubari human tribe has a different mix of native and ancient Nubari spacefarer blood, but you could maybe look to different human groups in Kara-Tur history, to see if you could equate one or more of the Living Jungle human tribes with an Oriental Adventures culture. Looking at this now, I think that a lot of the influence of the Ancients has overidden or even erased some of the Oriental Adventures culture, but if you built up a relationship between the history of Kara-Tur and the present day of the Living Jungle, you might be able to slip in one or two artifacts or magic items that would fit in with themes from Oriental Adventures. History of the Living Jungle wrote: Living in relative harmony with the modern Nubari are the diminutive shu, the wild korobokuru, the elusive tam'hi, and the shape-changing katanga. None of the modern people of the Living Jungle remember their ancient origins, and archeological clues are rare. Here, then, is a brief sketch of the history that contemporary characters do not know. So for each of those races (and for other races not mentioned here) you need to establish if they were natives to the Kara-Tur setting or outsiders brought in by the Nubari or who have arrived in some other way. The Oscray have a Spelljammer link, making that at least two SJ links this setting has. The Shou Lung and Wa both have links with the Spelljammer setting, so it is possible that one or both of these races somehow learned about Wildspace from the Ancient Nubari...or that they discovered Nubari artefacts. The Oscray are an orc variant (like the Scro from Spelljammer are). They use the same artwork as the Scro, but are supposedly peaceful. So I would actually argue that they are a different group of First Unhuman War survivors that have taken a different path. Isn't the main theme of Living Jungle to have dangerous jungle monsters? Perhaps making a list of Oriental Adventure/Kara-Tur monsters and then going through the list to look at the main theme of each monster would be a way to see what is the best fit. As for classes, I think that the Asian socieites of the wider Kara-Tur area might well have broken down a bit, if subject to continual oppression by dangerous monsters. I think that looking at the existing Living Jungle options is the way to go there. If there is anything that work with the canon Living Jungle cultures, you might be able to import it. Equipment and weapons might fit with the Living Jungle themes. I believe that a lot of the sword techniques in Japan were down to the quality of metal that the weaponsmiths were working with. If the same sort of metal was found below the Living Jungle and also below the wider Malatran area, then swordsmithing techniques might continue to be appropriate. The question is: Would those skills survive? Or does Living Jungle suggest that people use things that fit in more with bronze age cultures? Again, you can get an idea from any Living Jungle weapons and equipment that you see listed. If there are RPGA products with a wide variety of weapons, I would suggest that adding most - if not all - of the OA weapons might be appropriate. I like this idea! A "back formation" that inserts Living Jungle canon into Kara-Tur, would make those races feel more like native ones. They would probably need to have rewritten backgrounds, unless they were supposed to be escapees from the Nubari barriers. I does have the geographic positioning, and some of the oriental races (after a fasion) but no oriental classes, no system of Honor or karma, no oriental style weapons or the metal to make them, few oriental monsters (including no dragons) etc. Their belief system of animism is fairly consistent with oriental style religious superstitions. Lots of emphasis on the roll of spirits in their lives. All in all, when settings based on a fictionalized India such as Mahasarpa from the Oriental Adventures 3e web enhancement are considered OA settings, I don't tend to have problem with including Malatra as an OA setting. Though it is definitely unique. It might make for an interesting story to have a group of explorers form Shou Lung stumble upon the plateau somehow and gain access...but then we would be in 'Land of the Lost' territory. Well, by that token ALL fantasy based RPGs have a theme based around "dangerous monsters" :p No, that idea might be part of it, but the jungle is also about survival and growth in a inhospitable and inexplicable natural world. The fact that Taboo plays such a major part in their society means that it is nearly impossible for heroes to do anything without potentially breaking someone's taboo. This being the case, taboos did serve a purpose at one point, sometime a pointless purpose, but other times they were there to truly warn later generations of danger. The problem is, the later generations do not know exactly what that danger is, hence the inexplicable. Teramis designed the original Malatra. So the stuff she wrote would describe what it's like around the Living Jungle. Hopefully there isn't too much of a clash between her Malatra and the RPGA's Living Jungle version. Sorry Havard. I missed this. The same could be argued for Living City and Neverwinter, which are both contained by Faerûn, but which were promoted as stand-alone campaign settings (during the 2nd Edition Era and 4th Edition Era respectively). The trouble is, all of these things are cult product lines, and the number of people who know they exist, let alone the number of people who want to talk about them, is significantly smaller than the number of people interested in Forgotten Realms in general. So I'm not sure if any of these niche subcommunities is ever going to have anyone put in a forum request. I assumed that you could refer to Malatra as a Kara-Tur subsetting. But I suppose, you could just call it a Forgotten Realms subsetting even though it physically is located within the Kara-Tur region, if there are no specific OA themes to the Malatra setting. It got a bit more confusing once I realized there were two different versions of Malatra. I assumed that you could refer to Malatra as a Kara-Tur subsetting. But I suppose, you could just call it a Forgotten Realms subsetting even though it physically is located within the Kara-Tur region, if there are no specific OA themes to the Malatra setting. I was looking for Malatra topics today, and had no idea it was considered part of Kara-Tur. As an outsider, I cast my vote for nesting it directly under Forgotten Realms, rather than a sub-sub-forum of the Realms (i.e., a sub-forum of Kara-Tur). It got a bit more confusing once I realized there were two different versions of Malatra. This is news to me. What's the other setting? How did they both end up with the same name? Is there a topic that covers this that you could point me to? Thanks in advance! You could consider it a Kara-Tur subsetting, in the same way that Living City (also RPGA) and Neverwinter Campaign Setting (4e) could both be argued to be subsettings of Faerûn, rather than subsettings like Al-Qadim and Maztica, which are on different parts of the world. I think the difference here is the invisible wall around Malatra: Living Jungle specifically have cut it off from the surrounding parts of Malatra for thousands of years (or at least hundereds of years - I might look up the name of the barrier and start a topic about it). While people can simply walk in and out of the Living City and Neverwinter, even if the RPGA products for Living City and the 4e book treat those two cities as self-contained play areas. ADMINISTRATOR NOTE: When I created the Malatra: The Living Jungle forum recently, I put it outside the Kara-Tur forum for visibility reasons. It's not an "official statement" that Living Jungle is not part of Kara-Tur. So feel free to continue to explore the connections that do exist between Kara-Tur and the Living Jungle and the monsters and other things that could be borrowed from one setting and put into the other. Living Jungle is surrounded by Kara-Tur. Malatra is one of the geographical regions within Kara-Tur. Teramis created it long before the RPGA came along to create Living Jungle. Made people slowly turn away from the plateau, before they got to it. This hand-wave meant that the RPGA could insert an entire "Hotel California" region into the middle of Malatra, without having to worry about it conflicting with existing canon. The RPGA could just as easily have put this somewhere else. There is an Australia-like continent on Toril that has never been used and a South America-like island that has African themes. But they decided they wanted some links with Kara-Tur and picked Malatra as a place to insert their campaign. I think there was some behind the scenes politics about how the RPGA used D&D, as they used the Scro art, but called the spacefaring orc race they used Oscray. That's good for me, as I don't think there would be enough Scro and welcome other space orc variants, but I think that some of the control mechanisms of Living Jungle are there to stop it "polluting" Kara-Tur. I think that this topic is a good way to work out what stuff would work as "this got onto the Malatran Plateau from outside". Some Living Jungle stuff could be given a new backstory and used elsewhere and some Oriental Adventures/Kara-Tur stuff could be put into the Living Jungle. Both Living Jungle and Kara-Tur have been wound down by TSR/WotC and the RPGA material often seems to be set up in a way to avoid non-members learning much about it, but if Malatra: The Living Jungle had been a D&D Adventuruers League thing, I think the 5e designers might have come up with a story arc that made it a little bit easier to cross in and out of the Living Jungle. 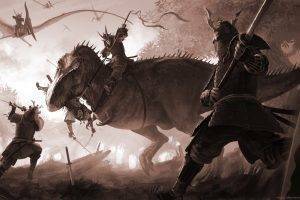 ...and we could have dinosaur-riding samurai!